I really don’t know what possessed me to change my domain name from my Typepad one to my own. But now it’s done there’s lots of tidying up to follow. 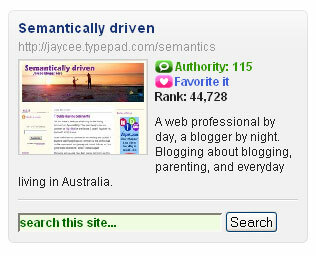 I went over to Technorati and even though all my old hyperlinks still work and I’ve still essentially got the same blog I’m back to a really crap score on my Technorati profile. See for yourself. I have other profiles all over the place too, and am changing my URL as I think of them. I’ve changed my Blogger profile which I only setup so I could comment on some blogs with relative ease. While I’m talking about commenting on Blogger blogs I have to say I don’t like the way they’ve setup the form. I’m a keyboard queen and if I tab around on this form the cursor doesn’t go to the next input box. Also if I start typing before it fully loads all the content disappears when it does finally load. Very annoying. I’ve also updated my Bumpzee profile. Fortunately it appears as though Bumpzee remembers me, but I’ll see how it goes. While I’m on the ‘B’ updates, I need to go to BlogHer and change my blog details there too. This is a work in progress for my benefit and anyone else who might be contemplating moving to their own domain from a hosted one. Will I regret it, or not? Stay tuned. « Ahoy there – got some news me hearties! The viral linking things have also given my technorati rank a shot in the arm. Well it sure looks nice, and “Flower and the Glory” love the pun. You will be ok after a month. 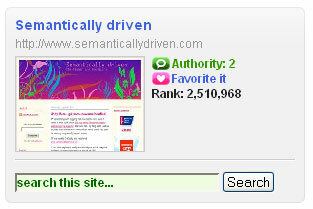 technorati (or Google) sure indexes the new url – if you have set up a permanent 401 redirect from your old url. How do you feel the move has gone now you have been here a few months?